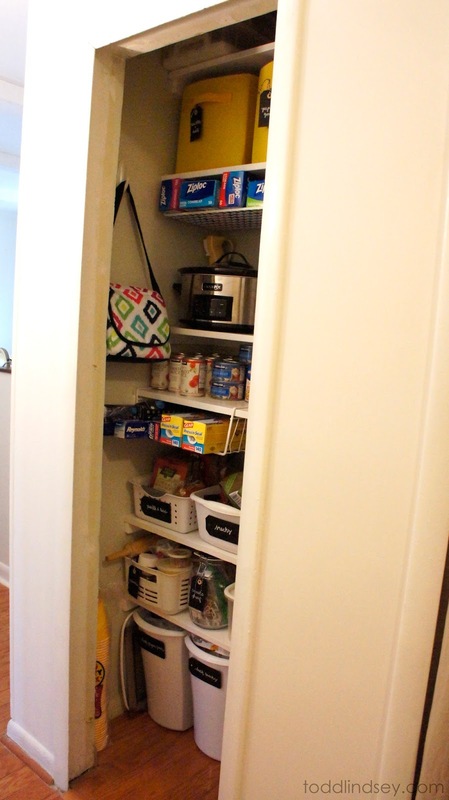 Domer Home: $9 HALL CLOSET TO PANTRY! 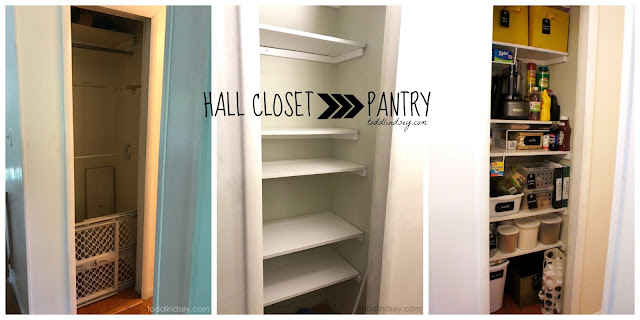 $9 HALL CLOSET TO PANTRY! 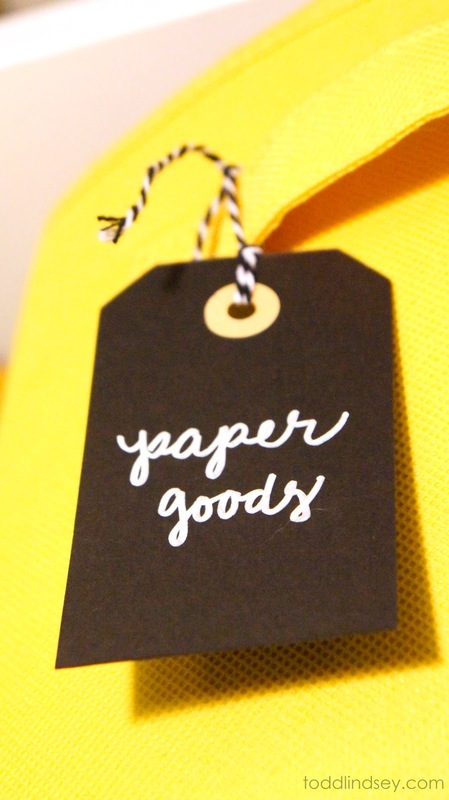 I have a gazillion projects going right now, and I can't seem to finish a single one! ... Much less find time to blog about them. I am going to go ahead and share this lil' project with you, even though it's not 100% complete. But really, what project is ever 100% complete? I'm always finding something to change or adjust! 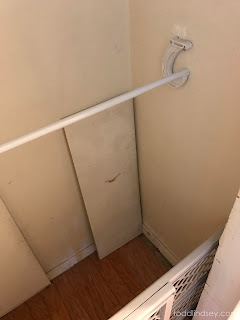 We didn't really need the upstairs coat closet for coats because I had installed coat hooks down near the front door. 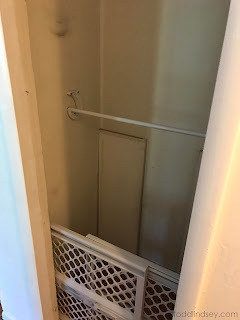 Plus, there is another closet in the basement right at the foot of the foyer stairs. 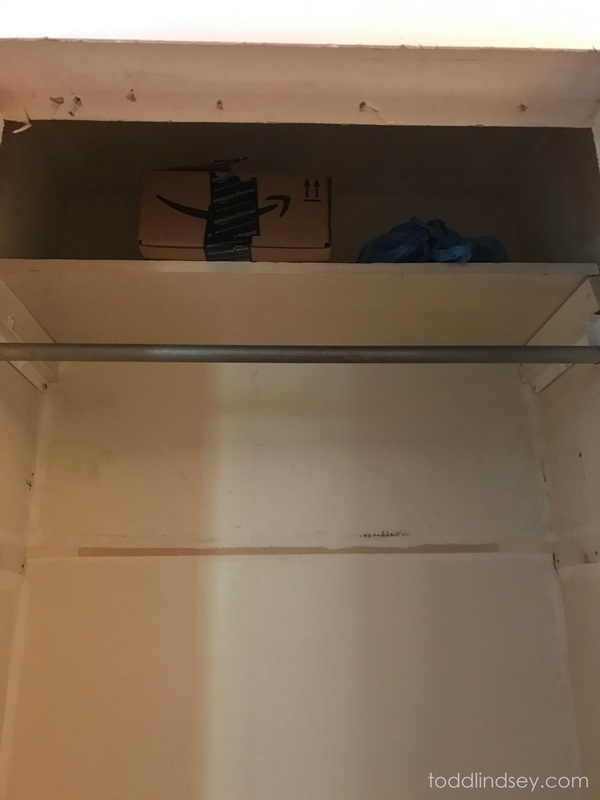 That closet used to be my pantry. 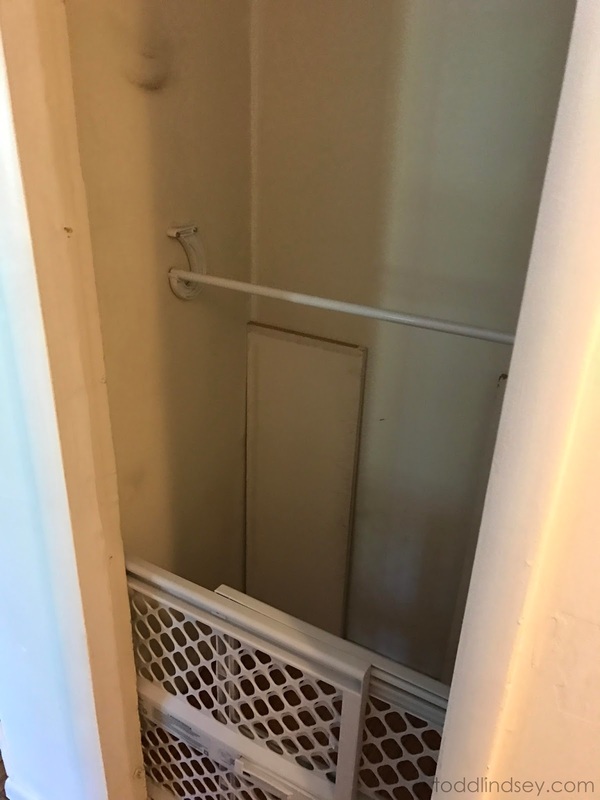 Then I got reallll tired of going up and down the stairs every time I was cooking something. So here are some "before" pictures to get us started. 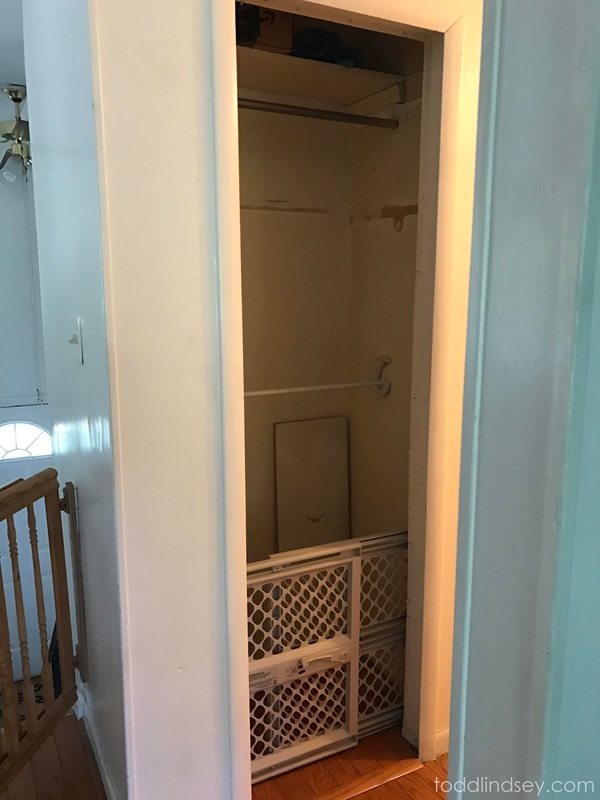 A former coworker gave us these baby gates (there is another one in the linen closet). We stuck them in the closets after we tore the accordion doors down. I sold both gates for $20. Todd removed all the old bars and fixtures, and then I did a lot of measuring. 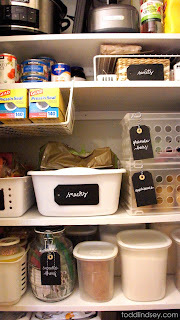 To ensure that all my stuff would fit in the pantry, I wanted to make sure I utilized every square inch of space! So I drew up a plan. 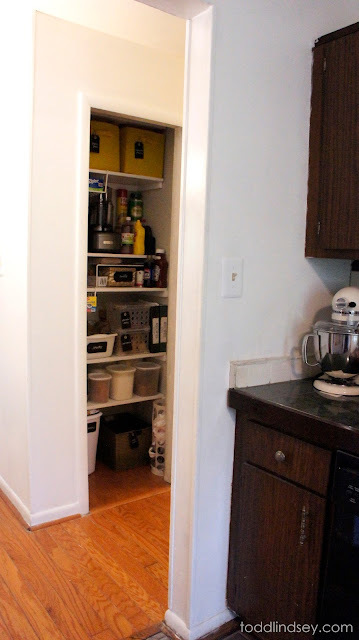 This was actually a lot of fun for me to design my "custom" pantry. 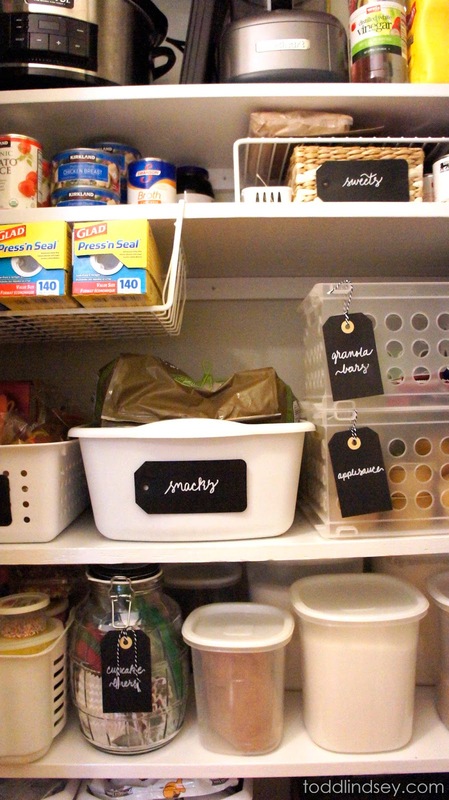 I have never had a pantry (besides in my house growing up). My apartment kitchen was actually quite large, and had a lot of cabinet space. My townhouse kitchen was reallyyyy tiny and didn't have a pantry. This kitchen isn't much larger, workspace-wise, however the room itself is larger (if that makes any sense at all). So I have been dreaming of a beautiful pantry for a long time now! My birthday was in June, so I asked Todd's parents to buy the shelving materials and install them for my birthday gift. 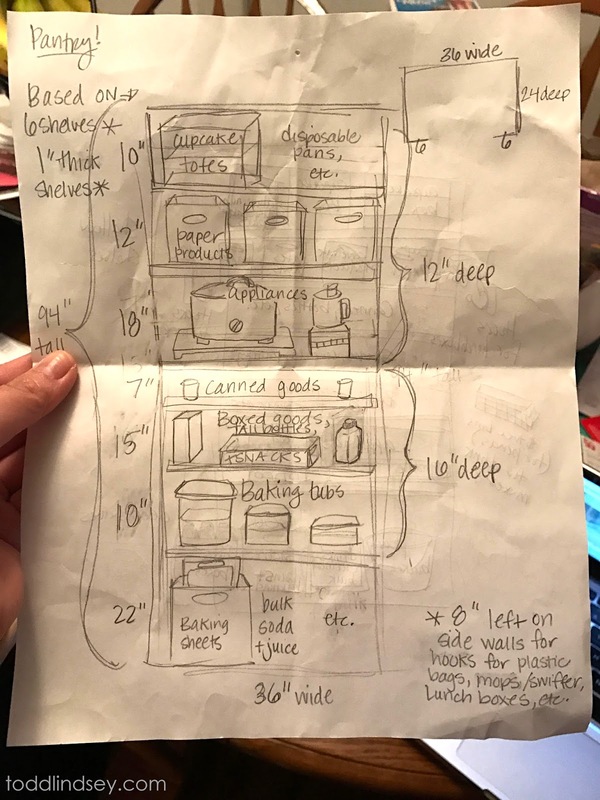 Todd told me that the shelving materials only cost about $30, for you DIY-ers out there who want to tackle a similar project. I started out by painting the walls before anything was installed. 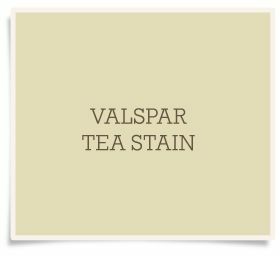 I used the color I had picked for the main living space (living room, dining room, foyer, and upstairs hallway). We went with Valspar Tea Stain, in an eggshell finish. I love me some neutral greens! All the shelving got two coats of a plain white paint in semi-gloss. 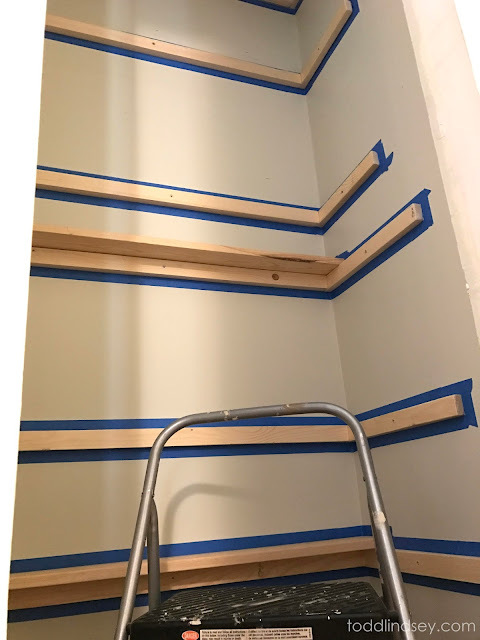 I used a can of trim paint that I already had. 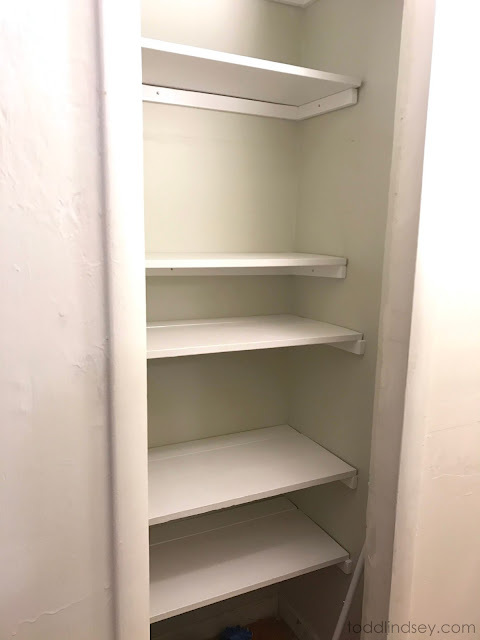 I added two coats of clear Polyacrylic to the tops of the shelves as well, to make it easier to wipe up any spills and to keep the surfaces clean. So let's tour the pantry now! 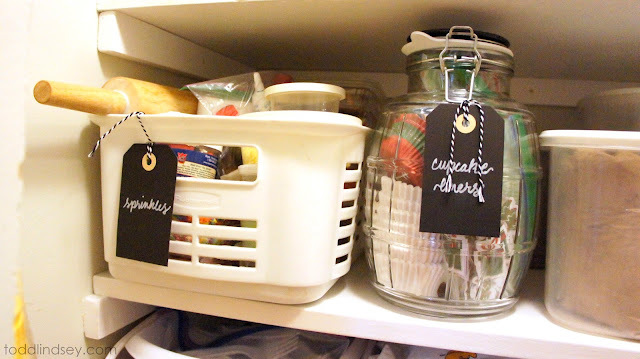 The veryyy top shelf houses my two cupcake containers. I bought the first one several years ago at The Container Store, and then I bought the second one about a year later at Costco. I used to use them all the time--- back when I had time to bake. 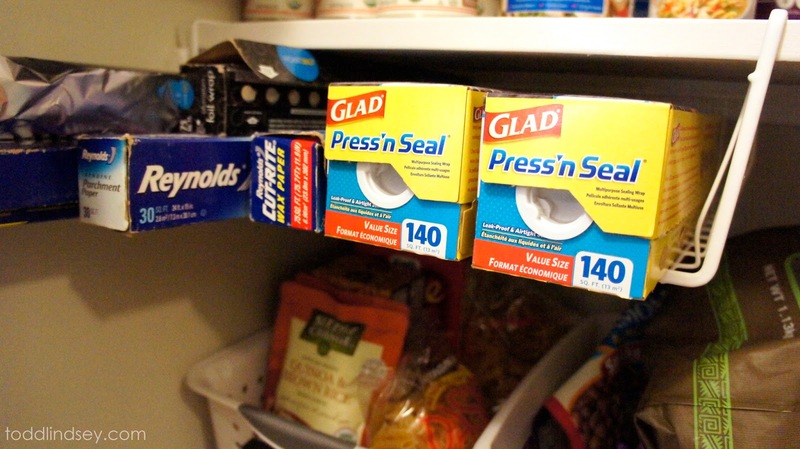 I don't use them as often now, so that's why they are on the top shelf. 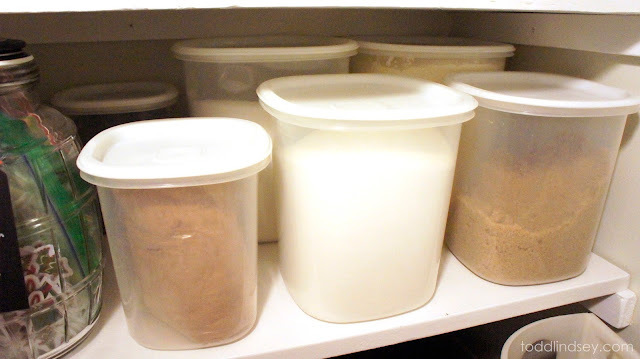 I also store baking supplies inside them, like disposable treat bags, my frosting tools, etc. One of the cupcake containers is not shown because it's down at my in-laws' right now. 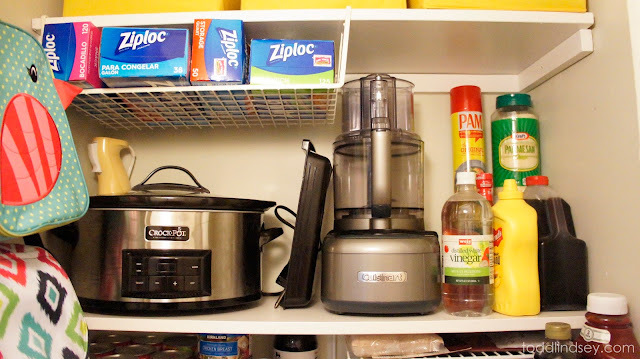 Also on the top shelf is a Dollar Tree container of cookie cutters, and my blades for my food processor. 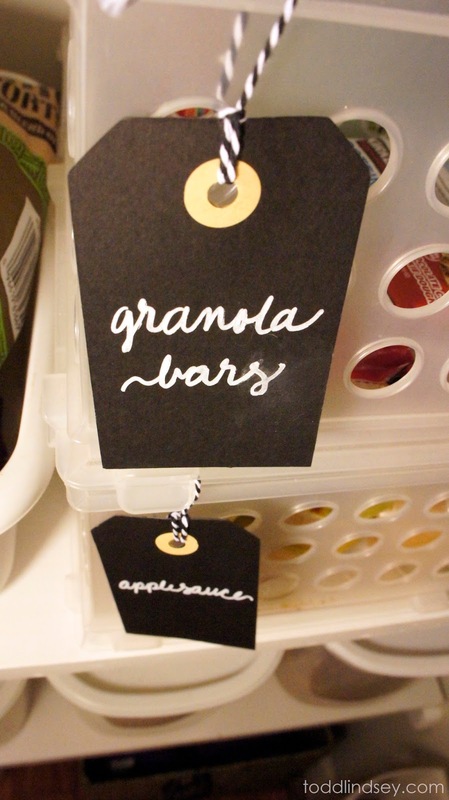 I'm lovin' these chalkboard labels! I went with the chalk marker pen instead of regular chalk so that it wouldn't be as dusty and smear off. 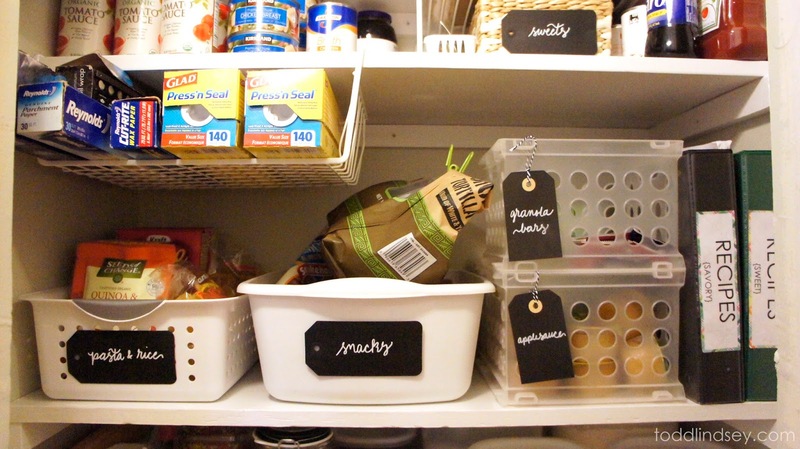 Chalkboard labels make it easy to switch out what's inside without re-doing all the labeling completely. 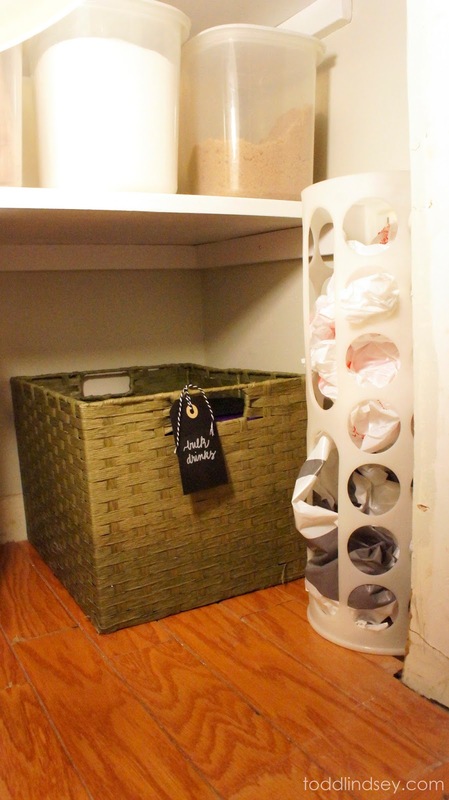 Next are my under-shelving baskets! The first one I snagged at the local thrift store. 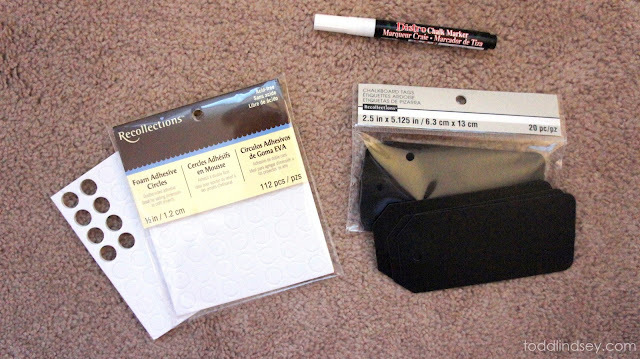 It came in a pack with three white metal wire shelves (stay tuned for those below) for $6. I figured it was a good deal, because I have seen large under-shelving baskets retail for $10 alone! 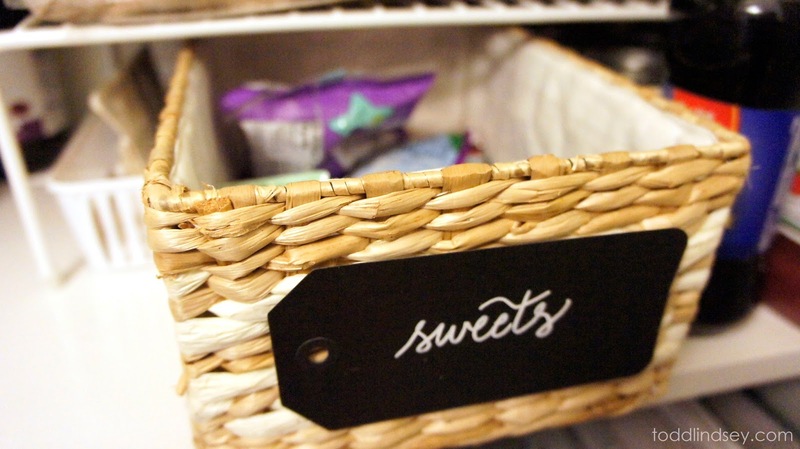 I used the large basket above for all my Ziplock products. I found a medium sized basket at Marshalls on clearance for $3, so I grabbed that too! The medium sized one holds all my wraps. 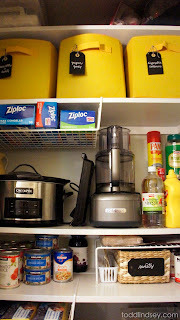 I used a Command hook on the side wall to hang lunch boxes from. 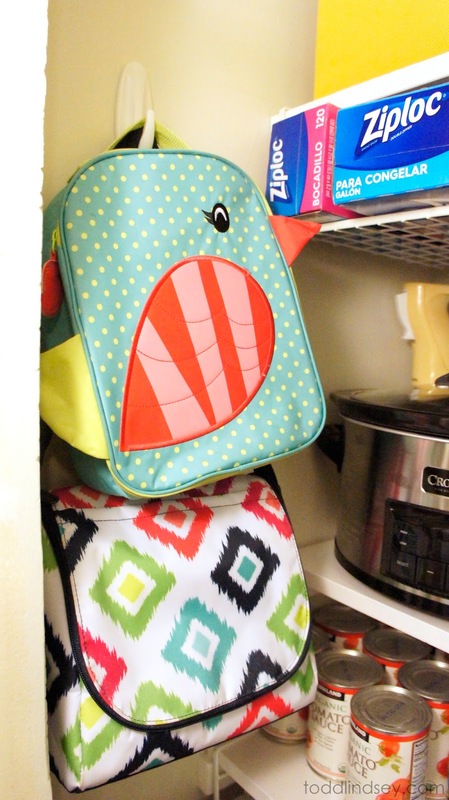 I love our thermals from ThirtyOne! 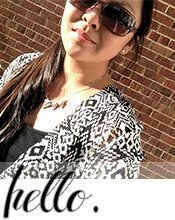 (Shoutout to my awesome friend and awesome consultant, Courtney!) Todd has a ginormous lunchbox that's really more like a small cooler, so that was not about to fit in the pantry. Next shelf up is the appliance shelf! I had originally wanted the shelf to be 12" deep to accommodate my electric griddle, but somehow the shelf only ended up to be 11" deep. 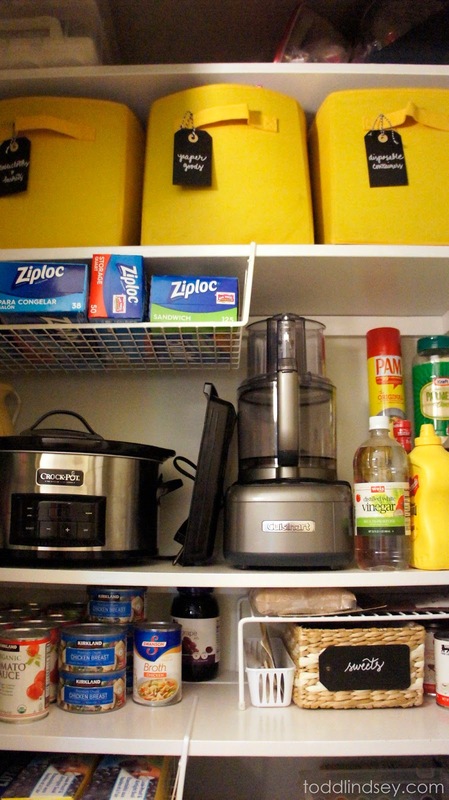 Otherwise, this shelf fits all my other appliances great! 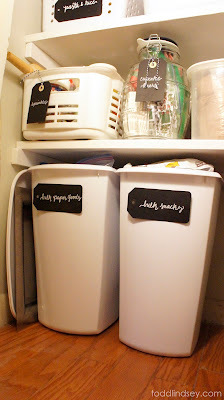 I am so glad they aren't sitting in my kitchen taking up valuable counter space and visual space. I have my Crockpot, immersion blender, electric griddle accessories, and food processor all here. 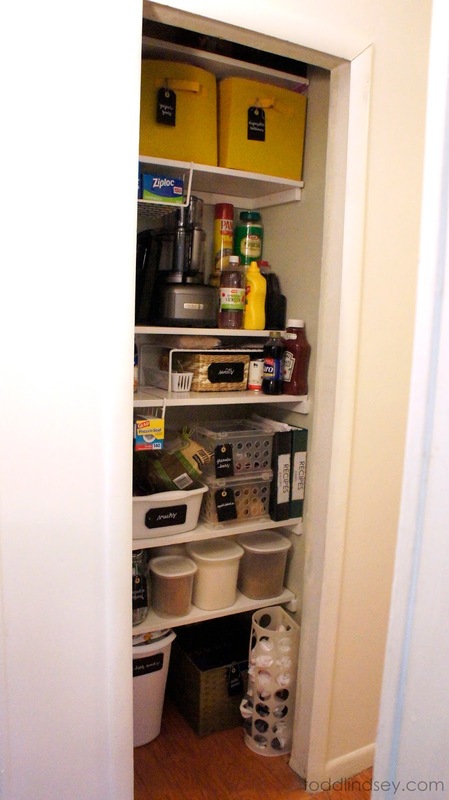 I even have space for tall bottles and food products on the side! 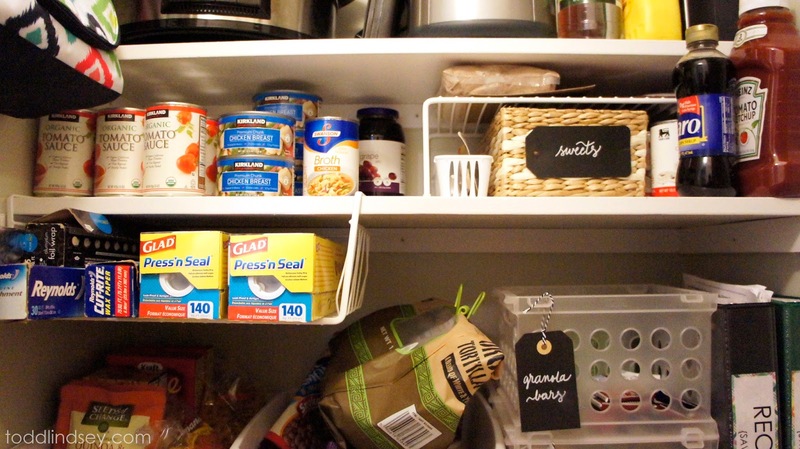 The "short shelf" is for my canned goods. 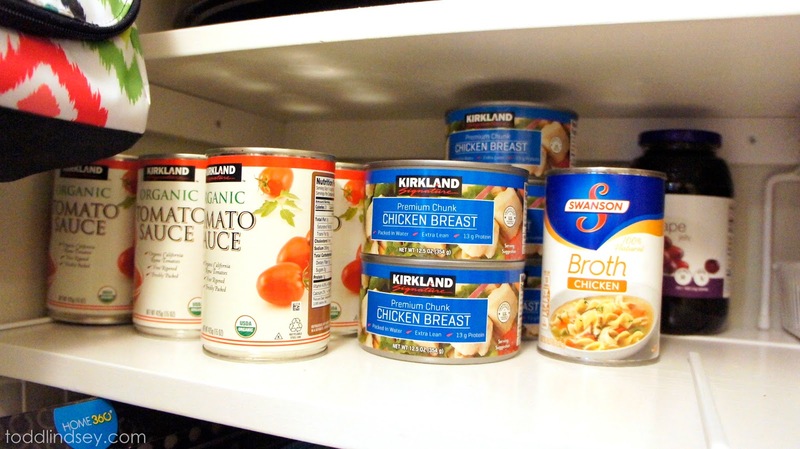 We don't have a whole lot, because I usually opt for frozen instead of canned. 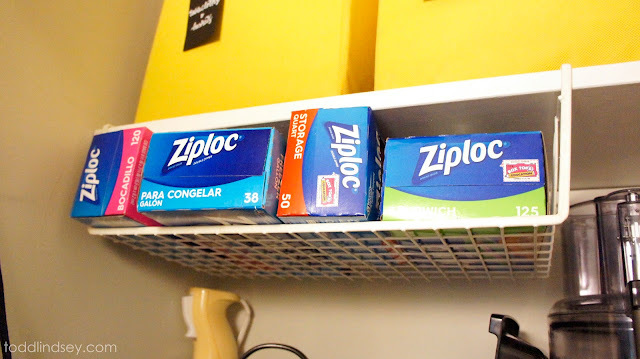 I stuck one of those wire shelves I was talking about here so that I could utilize the small space on top for packets, etc. Underneath I have a small basket I got at the thrift store to hold our sweets, such as packs of gum and small candies. I like that I can easily slide it in and out, just like a drawer. 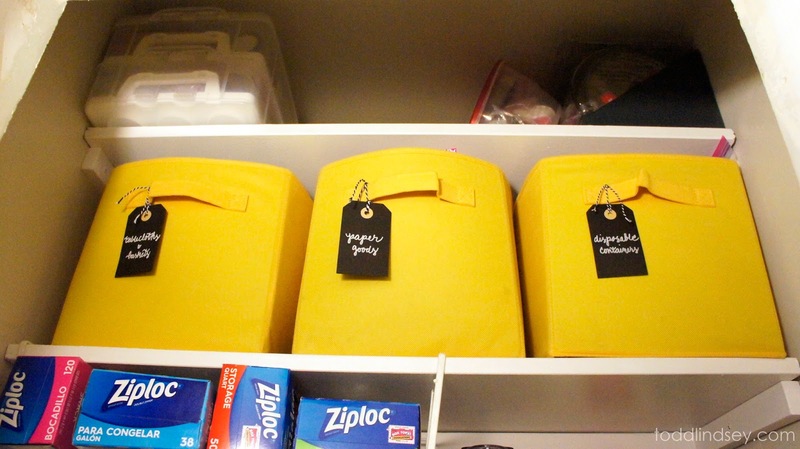 I have a bin for pasta and rice, and a dishwashing container for opened snacks. 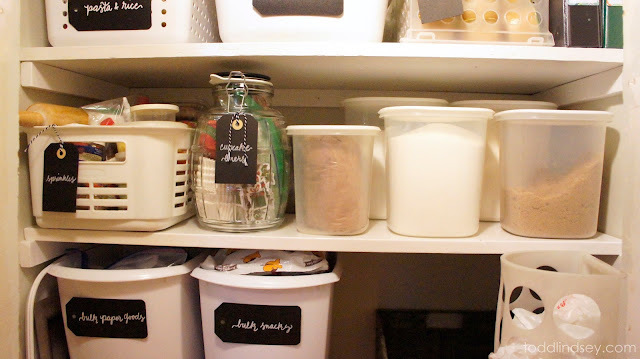 The mini clear crates are stackable; the bottom one holds applesauce cups, the top one holds Todd's granola/nut/protein bars, and the one in the back holds surplus applesauce pouches. 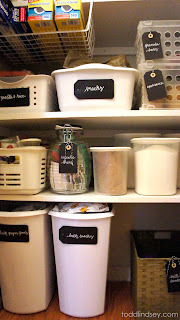 All of these containers I had lying around the house, so it cost me nothing out of pocket! 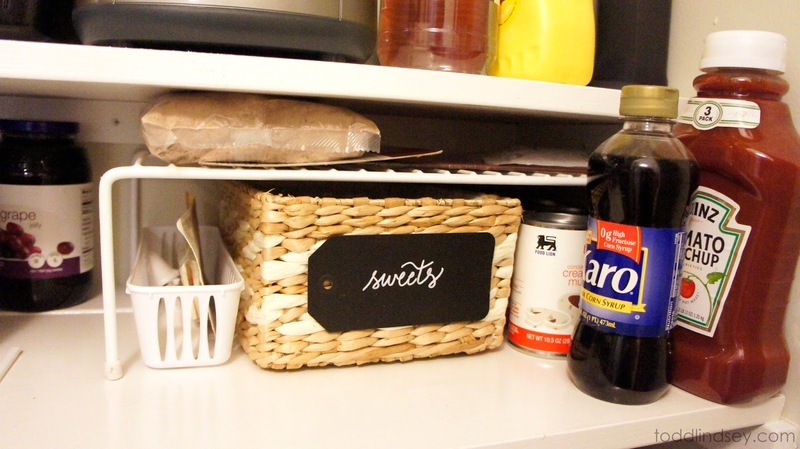 I have two binders for recipes--- one for savory and one for sweet. I have all my favorite recipes printed out and in plastic sleeve protectors, divided by category, and then divided alphabetically. I love the plastic sleeve protectors because I can just pull a recipe out, cook, and then wipe it down if it gets food splatters or spills. If you would like a future post on how I created the binders, let me know in the comments below! The lowest shelf is my baking shelf. I debated on putting the snack shelf lower, so that as Selah got older, she could get her own snacks... but do I really want that? :) Also, I don't bake as often as I used to, and I still eat lots of snacks daily (eeshh!) so I decided to put them more eye-level so they are easily accessible. I definitely have a container of exclusively sprinkles (and my few bottles of food coloring). I have quite the sprinkles collection! I have pigs, cows, school buses, various holiday themes, butterflies, and more! I am so glad I can share my sprinkles collection with Selah, who really enjoys picking out her shapes, and eating them with her ice cream and yogurts. I got a whole box of glass canning and mason jars from a yard sale. I guess this one came to about $2 in the end. (I got the whole box for about $15, and then sold several that I didn't need. This one is originally from Ikea.) 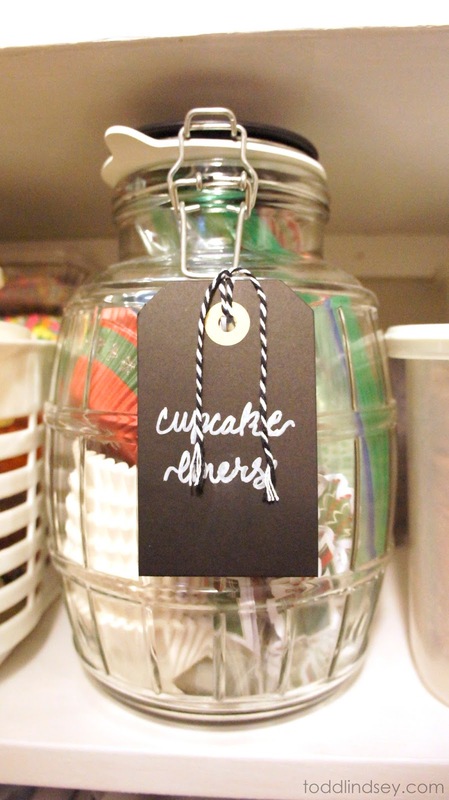 I am storing my cupcake liners, cupcake toppers, and birthday candles in here. All the toppers and candles are in individual snack baggies. I have two sets of these heavy duty plastic containers from Walmart. They were only a few dollars for each set, and I believe they came with four sizes per set. I have had them for many years now, and they are still in great condition! They are perfect for all my baking ingredients. 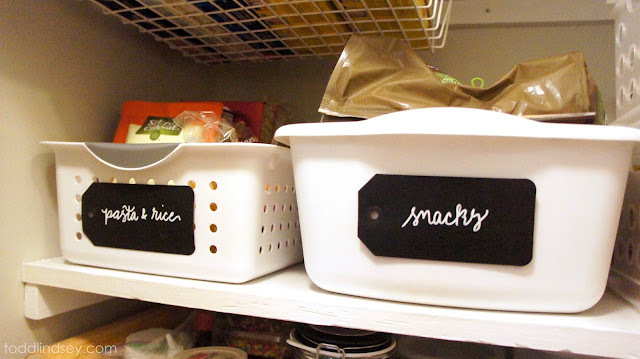 I have my eye on some chalkboard labels for them, except the ones that I want are dishwasher safe, meaning they are on the pricier side. I think I'll wait on those. On the floor I have two trash cans from Walmart that were only a couple of bucks each. In the left one, I am storing our bulk paper supplies, and in the right one, I am storing our bulk snacks that haven't been opened yet. 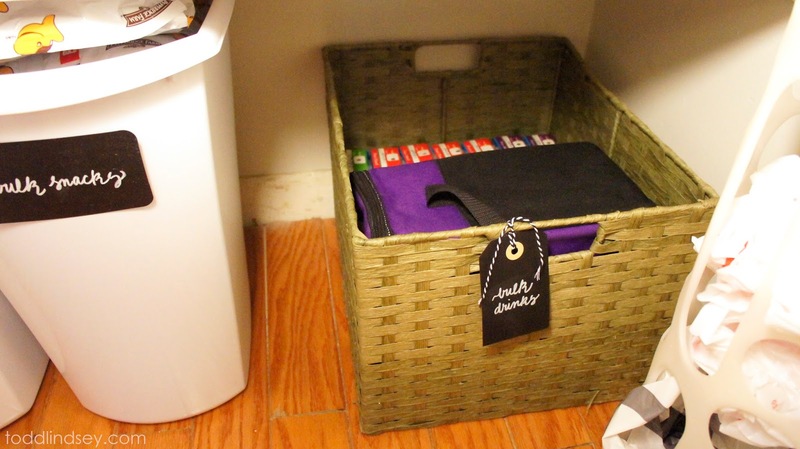 On the right, I have this large basket that I got at the thrift store awhile ago. 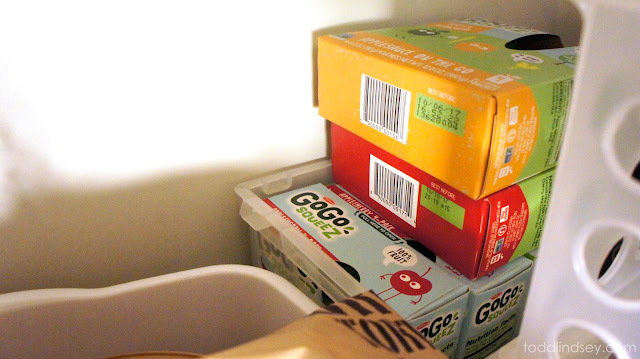 I am storing our bulk drinks in there, like Selah's juice boxes and Todd's protein drinks. I also have a larger cooler/lunch box in there. Eventually, I want to get a large can storage system for all of Todd's canned sodas that we get at Costco. Right now, they are sitting in a box in the middle of the kitchen floor. Trust me--- it gets pretty old, pretty quickly when you have to walk around that box numerous times a day, especially when you are trying to cook! So here's a summary picture of all the shelves together! It was really, really hard to get them all in one shot, since there is a wall directly across from the pantry. And now, like per usual, all I need to do is finish the door situation! 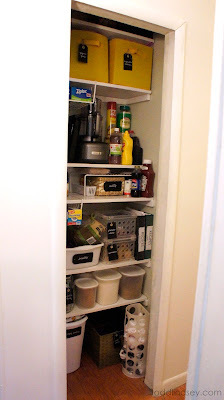 I'd like to put bifold doors up on the pantry and the linen closet right next to it, but those are pretty costly. 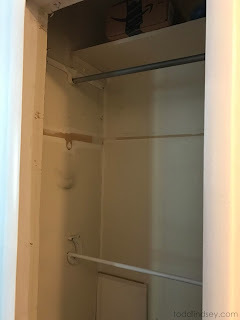 I got some doors that would fit each closet at a yard sale for super cheap, but I am having difficulty figuring out how to install them. They are older metal bifold doors, and both Lowes and Home Depot do not sell track systems for metal doors... only wooden doors, and trust me--- they don't fit. But I figured I should just go ahead and post what is finished, otherwise I might never get around to posting this project! Thanks Dan and Debbie for this awesome birthday present! We all use it and enjoy it every day! Labor and materials for shelves | FREE // birthday gift!